Enjoy this Personalized Man Cave Bar Metal Sign - Lions Crest in your home bar area, Man Cave, game room or other favorite room. Personalize with your name with up to 18 characters. 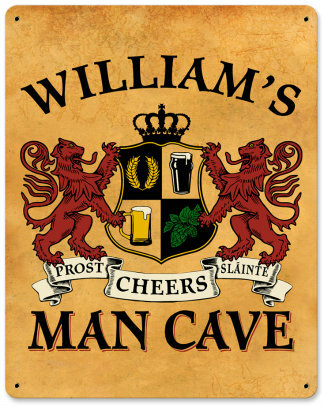 Durable and attractive, this personalized man cave sign is 12 in. x 16 in. and has a long lasting finish. It is drilled and riveted for easy hanging. Proudly hand made in the USA, this sign is just under 2 lbs and is made of heavy 20-gauge American steel. Therefore, this is NOT a flimsy sign. A Man Cave Gifts Exclusive!